It doesn’t always happen that we (DIYframing) have such a speedy effect on people’s plans. 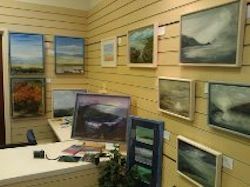 From signing up for a framing weekend with Linnette in the middle of February 2013, through finalising a deal for a 2 month contract on a Stourbridge shop in March, to its opening in early May, must be a record for any of our customers. Kevin Street was in full – time employment, in the education sector, managing a team of teachers who support the education of looked after children. But art was his serious hobby and, now that he is semi-retired, it’s this that Kevin is passionate about pursuing. The idea of framing his own work had a massive appeal: it offered convenience, flexibility plus the bonus of achieving exactly the look he wants for his own work. He also enjoys the physical nature of this type of work juxtaposed with the work he continues to do in education. So all in all, he ends up with the frames he wants and enhances his quality of life. Of course it could all have fallen apart at the first hurdle. Having completed his 2 day training with Linnette he was really spurred on by the realisation that he could, indeed, “do framing.” Whilst High Wycombe is not on Kevin’s doorstep, he found the training there, plus the chance to take direct advice on kit and see what various items could offer, to be exactly what he needed. 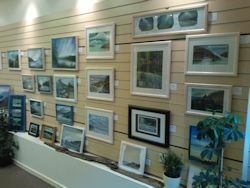 So, just one week later Kevin was back, equipment purchased and starting the process of securing a temporary shop for 2 months to display and sell his art. For the three weeks before opening, he managed to make 26 tray frames, 13 glazed frames, with mounts, and adapted 7 frames he already had. 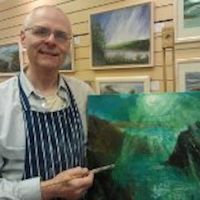 He has also found it highly rewarding, matching the colours of the paintings with the frames as well as the great results produced through using liming wax on natural wood mouldings. The framing kit is set up in a studio at home: a Logan 450 mount cutter and Pro saw; mitre trimmer for perfect corners and, the jewel in the crown, the Inmes underpinner. As space in the studio is a little tight, the underpinner has the luxury of living ‘next door’ in the summer house! 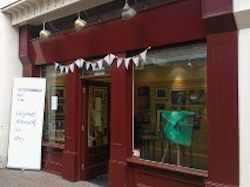 Kevin’s Pop-Up Shop, Stourbridge on Sea, opened on the first weekend in May. It is doing well and hopefully is acting as a focus for a “yet to be formed” but definitely in the air “Stourbridge Artists’ Cooperative”. This will build on what Kevin has already kick started with the shop ... watch this space! Framing could definitely be a part of this initiative, especially as, from the moment he opened on the Saturday, he was having to deal with enquiries about whether he does framing. However, at the moment, the art has to be Kevin’s primary focus. Everyone at DIYframing is hugely appreciative of the recognition and great feedback he has passed back to us. But, there can be no doubt that the real inspiration is not only the confidence Kevin has to add his own framing to his art, but also the real enthusiasm and drive he displays in setting this all up in such a short time and to such an impressive standard. His ideas should do well, but they also thoroughly deserve to succeed.